The original plan for this camping trip was to start on lower Deep Creek and work our way to the headwaters over the course of several days. With that goal in mind, we wanted to fish the big bend around Bumgardner Ridge above campsite #60 on our first day. When we arrived Wednesday evening, the stream seemed fairly high after rain a few days prior to our trip. Since neither of us had ever fished the bend, we didn't want to get in there with water conditions being a little high. So, after some discussion, we decided to fish water immediately downstream and upstream of camp for our first day. This proved to be an excellent decision. As with much of the fishing this time of year, things started out rather cool on Thursday morning. With the cool start, the fish were a bit slow getting going. We caught a handful of fish here and there, but it wasn't until the sun had been on the water a couple of hours that things really got going. We walked back downstream to campsite #59 with the goal of fishing back to our camp (#58). Deep nymphing proved to be the magic formula early. I was fishing a double nymph rig while John was working a dry/dropper. Throughout the shady stretches, I caught a few fish deep but it wasn't until he through into the first little patch of sunlight reaching the creek that John got a rise to the dry fly. By the time we were approaching campsite #58, sunlight had reached nearly the entire creek valley and the fish were starting to really turn on. Lots of small brown trout were in the flats immediately downstream of camp and were more than willing to smash the dry fly or run with the little Pheasant Tail dropper. When the bear cables at our campsite came into view, we were both getting hungry and lunch in the comfort of camp seemed like a good idea. Here are a couple of pictures from the morning session. After lunch, we hustled upstream to check out the water between campsite #57, #56, and #55. 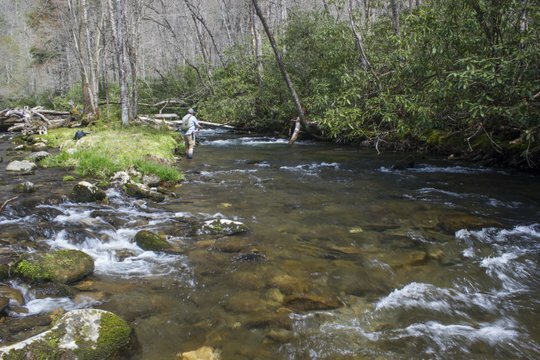 This is probably my favorite backcountry water on Deep Creek when it comes to fishing for brown trout. I've caught some really big brown trout (for the water) in this stretch in past years and was hoping for more of the same. Because of the elevated water levels, getting around was a bit tougher in this stretch than I am used to. Fish were out and hungry though and the fishing was good. I kept switching back and forth between a double nymph rig and a dry/dropper rig. Fish were coming up to dry flies just often enough to want one tied on, but more were eating the nymphs. As usual, my simple caddis pupa was accounting for a lot of fish. 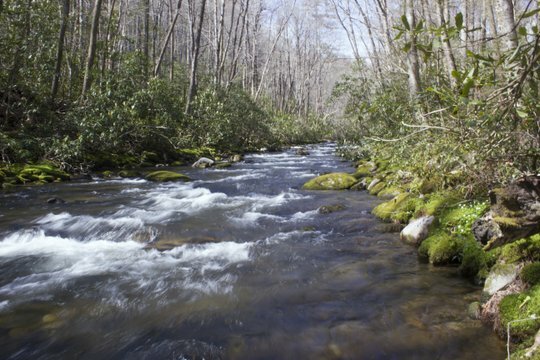 Deep Creek and other North Carolina streams have an insane amount of caddis. We only noticed sporadic mayfly activity which seems odd this time of year. However, the bright sunny day definitely wasn't helping us when it came to good hatches of mayflies. While no single fish really stands out from that day, we did catch plenty of very healthy and fat rainbow and brown trout. Each fish was carefully released to grow some more and hopefully be there the next time I return to Deep Creek. Here are a couple of fish from our day. By mid afternoon, a stout breeze had kicked up. In fact, things got a bit dicey for a while. The wind was really rolling through the Deep Creek valley and every once in a while, large branches would fall out of the trees. We also heard some huge crashes back in the woods. There are many dead hemlock trees along the banks of Deep Creek and this made for a more exciting than usual day. It got bad enough at one point that we actually discussed whether we would need to get our stuff and hike out. Thankfully, just about the time it was really getting unbearable, the wind started to ease off. The rest of our trip wouldn't be that windy. Read Part One of our Deep Creek Trip HERE. 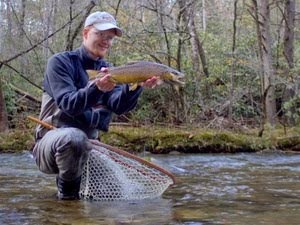 For information on guided fly fishing trips in the Smokies, please visit our guide site, Trout Zone Anglers. Rivers are like old friends. You may not see each other for a while, but when you do, things pick back up right where you left off. Deep Creek on the North Carolina side of the Smokies is just like that for me. I'll routinely go several months and often more like years between trips there, but each time I stop by, it always seems to show off for me. I once caught my largest brown trout at that point in my angling career in the Great Smoky Mountains in Deep Creek. I've also spent more long hiking days there then anywhere else in the Park, at least with a fly rod in hand. My favorite trips have tended to be multi-day backcountry trips. Several days in the woods with a fly rod is good for the soul. That said, I'm selfishly glad that more people aren't lining up to try it out. Solitude is always a huge part of the draw for me when I'm in the mountains. I've made many good memories on Deep Creek, and I just got back from yet another incredible excursion. The most recent trip happened the way most trips do, with an offhand comment. When my friend John mentioned that he enjoyed backpacking, I agreed with a "if you ever want company on a trip let me know." Several months later, we both had cabin fever and were thinking about the good fishing of spring. I have fished nearly all of Deep Creek at some point or another, but never in one sitting. I floated the idea of a hike from top to bottom or perhaps bottom to top and John quickly agreed. From there on, the trip took a life of its own. Once permits were secured, we were mostly committed to heading in on a Wednesday and not hiking out until a Monday, a glorious five nights and six days in the backcountry. 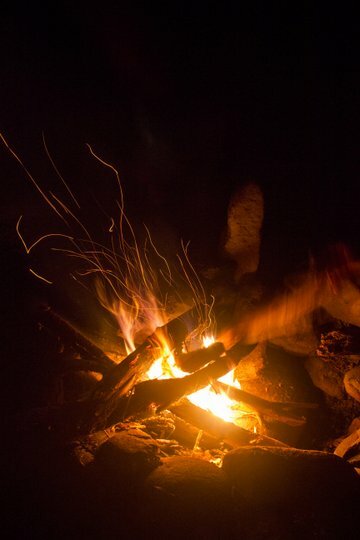 I say mostly because the whims of weather, among other things, are what actually dictates any camping trip. While I have no problem roughing it, I also don't want to be in the middle of the mountains during an extreme weather event. Then, two weeks before the scheduled departure date, I came down with the flu. Staring at a hard deadline to get well, I committed to lots of rest and plenty of fluids and Vitamin C.
The weekend before our trip started, I found myself hiking 5+ miles and feeling good the next day, so things were looking up. After following that up with a couple of days of guiding, I knew that I would be fine. I had scheduled Tuesday off, so it was spent with a last minute trip to the grocery for a few food items and with packing which consists of cramming way too much stuff into my old Lowe Alpine backpack. My packing list seemed a mile long, yet I couldn't reasonably get rid of too many things from that list: backpack, tent, sleeping pad, sleeping bag, pillow (a tiny inflatable job), headlamp, trekking poles, various items of clothing, jacket, rain jacket, TP, bear spray (a simple precaution), cookware, cookstove, fuel, food, water filter, water bottle, camera, oh and plenty of fishing gear. I normally carry way more fishing stuff than I need and this trip was about par for the course. The highlight of this particular trip was my new Patagonia ultralight wading pants. I think they call them the Gunnison wading pants. Turns out they were one of the better purchases I have made in a while along with the ultralight wading boots from the same company. My wading gear now weighed less than just my usual wading boots. They are great boots, I should add, but a little heavy for backcountry camping. In the end, I was torn between wet wading and taking my new wading pants, but ultimately I knew that the water would be cold in the mornings if nothing else. Finally, the big day had arrived and we met up in Townsend at Little River Outfitters. This allowed us to get any last minute necessities if we thought of something. From there, we made the drive over the ridge on highway 441. Lunch was a quick stop for Italian food in Bryson City and plenty of carbs to power our hike. Over lunch, we made what turned out to be a very smart decision. With the weather forecast was looking good, up until Saturday. From there on, it would deteriorate to a day of rain and perhaps storms on Sunday. We decided that the smart thing would be to hike out on Saturday before the nasty weather arrived. Hitting the trail, we finally started towards our destination for the next three nights, backcountry campsite #58. The spring wildflowers were blooming in profusion, and I was wishing that the camera wasn't packed away so efficiently. We really needed to make it to camp, though, so I mostly left it alone. 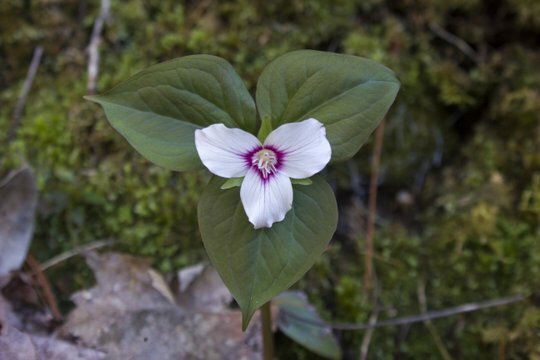 The one exception to that was when I saw a Painted Trillium by the side of the trail. This was a treat, especially at the lower elevation we were hiking at. I took off my heavy pack and dug out the camera for a quick picture. Continuing along, we managed the always painful climb over Bumgardner Ridge before descending back to the creek. The final approach to our campsite featured a series of short climbs and descents with some level stretches mixed in for good measure. The trail sticks to the east side of Deep Creek except in the lowest reaches, so there is a lot of up and down as the creek meanders up against the steep hillsides. Finally, we passed campsite #59 and then Nick's Nest Branch. As we turned the corner from the creek, our campsite was dead ahead. As it turns out, #58 was a very nice campsite with benches alongside the fire pit. This was perfect for us to spread our gear out and cook our meals among other things. We got our tents up, and otherwise organized the campsite for our stay. Firewood was collected, and supper was cooked. With a full stomach, I soon turned my attention to other important items. As the sun sank low in the western sky, I decided to quickly rig up. I was dying to try my new wading pants and catch a fish or two! The water was still up from recent rainfall, so I went with a deep nymphing rig including my favorite caddis pupa and a light pink worm pattern. Some split shot made sure I was getting down. Finally, in a small pool just above the campsite, it happened. My line ticked, I set the hook, and the first rainbow trout of the trip soon came to hand. The gorgeous rainbow was fired up and jumped several times. Read part two of the story on this backpacking trip HERE. 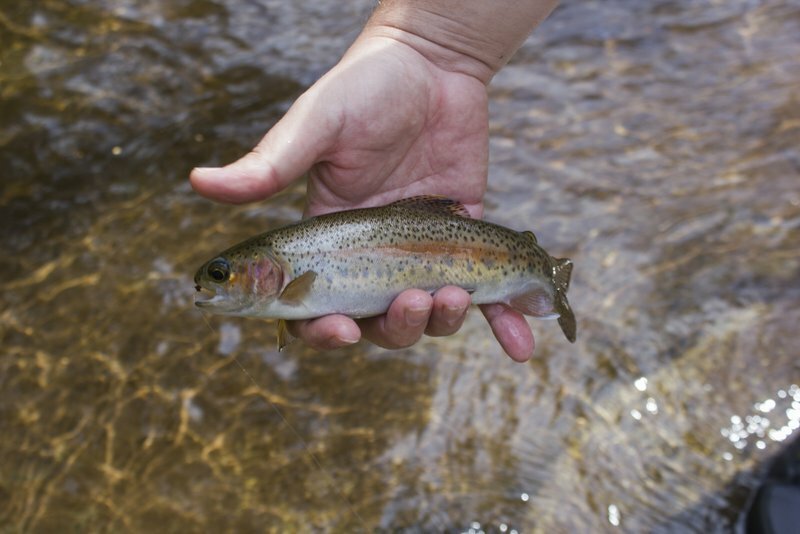 Find information on a Great Smoky Mountains fly fishing guide HERE. The same weather system that brought such enjoyable fishing on the Gibbon River turned decidedly colder as the day wore on. After fishing longer than I deserved, the rain had begun in earnest and my lovely wife was getting cold and wet watching me fish. It was time to give up on the fishing and look for warmer ways to spend the remainder of our day. Getting in the car, we cranked up the heat and debated where to go. A late day drive seemed like a good idea. Perhaps a bear or wolf might be out wandering around in the deteriorating weather looking for one last meal before the weather got too nasty. 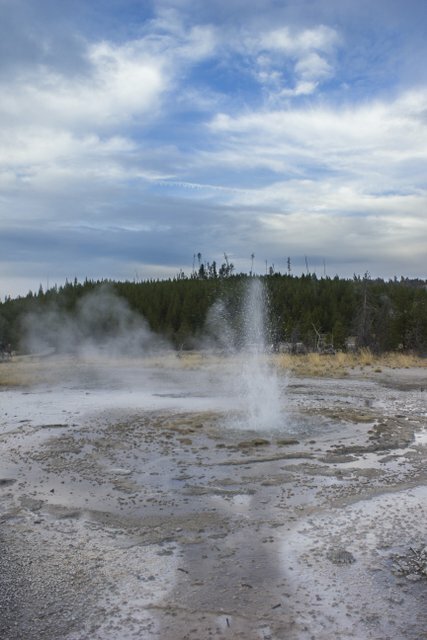 After some discussion, we pointed the car towards Mammoth Hot Springs and embarked on a long loop drive through the northern reaches of Yellowstone National Park. Rain was fairly steady by this time although not particularly heavy. In fact, if it was much lighter I probably could have fished the Gardner River. As is usually the case, the rain mostly eased off in the vicinity of Mammoth Hot Springs. 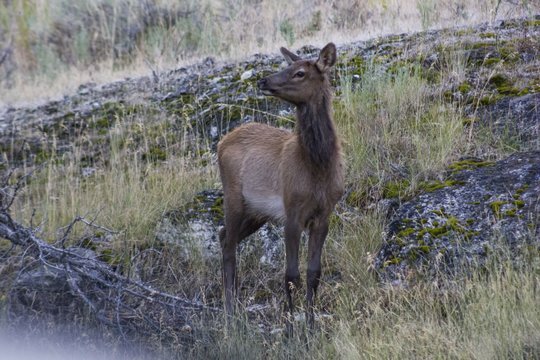 Some of the resident elk were out grazing and I snapped a couple of quick pictures out the window as we rolled past. A quick restroom stop allowed me to get a picture or two of one of my favorite western birds. 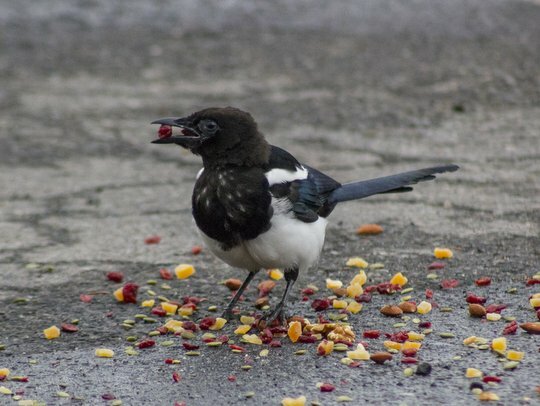 Magpies are so striking and one of the big treats for me when I travel in the Rocky Mountain states. Since I don't get to see them often, I have to try and take at least a few pictures of them when I'm in their native range. Someone had dumped some trail mix or something similar in the middle of the parking lot. 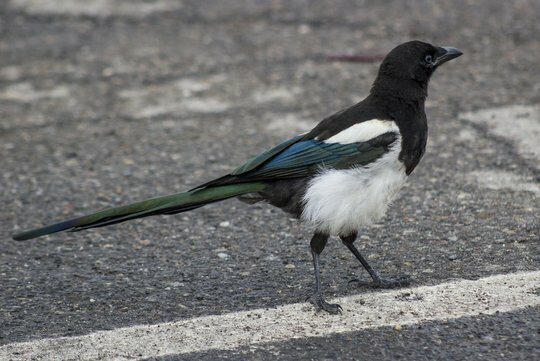 Magpies were coming from all around to get in on the excitement. I patiently waited in the car and snapped pictures as they swooped in for a snack. Here are a couple of my favorite pictures. While the rain was minimal at Mammoth, we still had to travel back to camp at Norris and our intended route travelled up and over Dunraven Pass. The loop would take us to nearly 9,000 feet in elevation and with the cold weather, I was wondering if the pass would still be open. 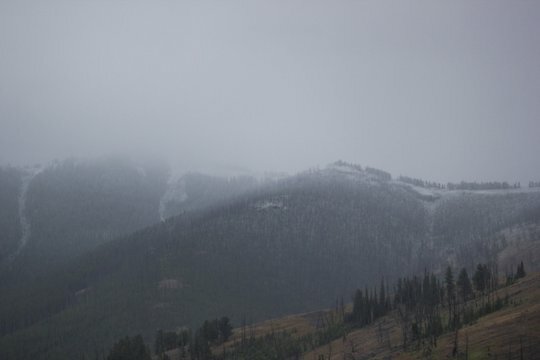 Snow was a distinct possibility even though it was still summer supposedly. 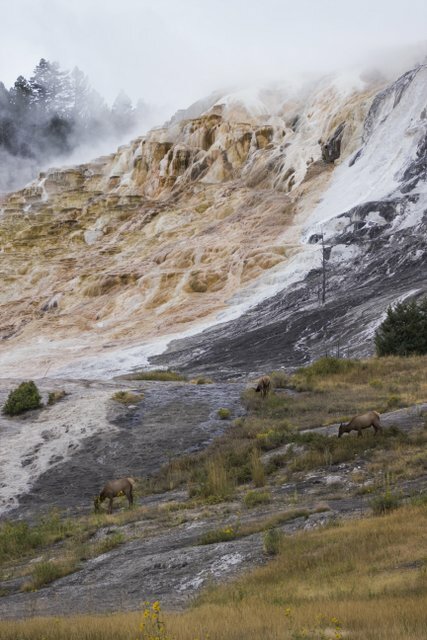 The calendar said August, but the chill in the air suggested an early winter might be descending on Yellowstone. As we began our long ascent towards the pass, the views opened up long enough to see what was happening up towards Mount Washburn. At this point, I was certain we would see snow. The only question that remained was how much. Thankfully, there were not too many other vehicles out and about. We were able to take our time and enjoy what will likely be the only August snowstorm either of us ever experience. The woods were magical. The snow was heavy and wet, coating all the trees with a thick white blanket. I was mildly nervous as I didn't relish the idea of spending the night out on a snowy road, but eventually we were over the pass and back on a downhill grade. By the time we reached Canyon, the snow had turned back to a fine light rain which continued all the way back to our camp at Norris. The snow stayed just a few hundred feet above us that night, but when morning broke I had a good idea. With the fresh snow, it was time to visit the Tetons. Check back soon for pictures from that adventure! 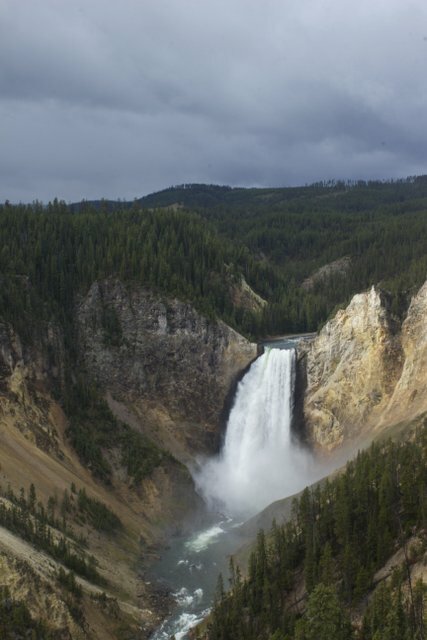 If I had to pick one river that draws me back to Yellowstone National Park time and again it would be the Gibbon. Primarily featuring gorgeous meadow water, the Gibbon River also has some canyon sections, water falls, lake run fish, and huge resident brown trout. The Gibbon River is also a stream facing significant challenges and unfortunately may not long be a stream worth fishing. 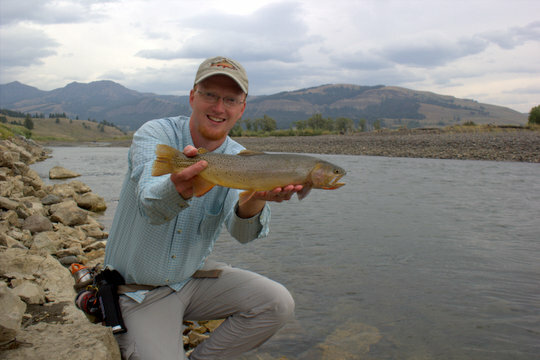 Despite those challenges, fly fishing the Gibbon River still provides some of my favorite fly fishing in Yellowstone. In my most recent Yellowstone trip, I had a chance to spend a little time on this wonderful stream. 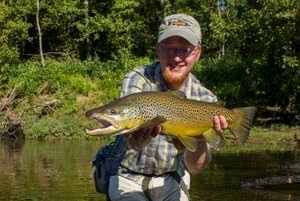 Before that story, here is a bit about fly fishing the Gibbon River as well as challenges facing this incredibly unique fishery. The Gibbon River can be split into several distinct sections. The lowest and probably most famous water is from Madison Junction upstream to Gibbon Falls. This section hosts tremendous numbers of large rainbow and brown trout from Hebgen Lake from fall through early spring of each year. The brown trout head upstream from the lake through the Madison River on a spawning journey that eventually finds them in either the Firehole River or the Gibbon River. Rainbow trout move into the system as well for the same reasons. While many anglers make the journey to Yellowstone in October to fish for these incredible trout, I prefer fishing areas upstream from this section simply for the challenge that they present. 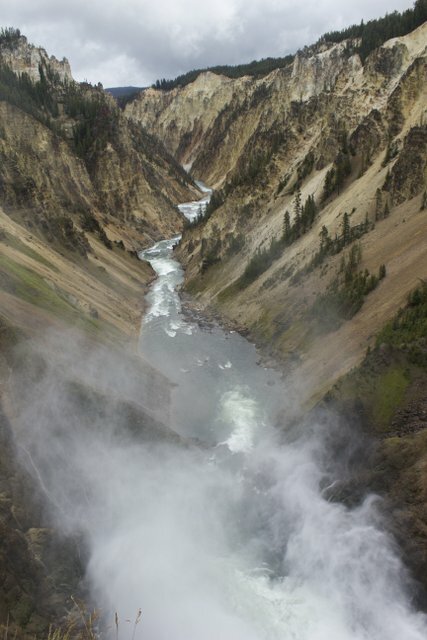 The next section of the Gibbon River is the canyon from Gibbon Falls upstream to Gibbon Meadows. This canyon section provides some great fishing both early and late in the season. Fish are not very large on average although a few larger fish are present. In Gibbon Meadows, the river slows down and meanders slowly across a wide landscape. A few large trout may be found here, but few anglers are up to the challenge of stalking them. Upstream from Gibbon Meadows is another short canyon stretch which ends near Norris in another meadow section. Elk Park provides more meandering meadow water and is also some of my favorite water on the river. Meandering behind the Norris Geyser Basin, the Gibbon leaves the road for a couple of miles before returning and providing easy access near Norris Campground. If you want to fly fish the Gibbon River in its upper reaches, stay at this campground. Above Norris, the Gibbon enters another canyon leading upstream to Virginia Cascades. Above this scenic waterfall is another beautiful little meadow known as Virginia Meadows. This water previously had some fantastic fishing for wild brook trout although I've also caught cuttbows here with more rainbow heritage than cutthroat. Those fish are no longer there, however. Above Virginia Meadows, the river and its tributaries flow through heavy brush as it descends from Grebe Wolf, and Ice Lakes. This entire section was recently treated by the National Park Service. 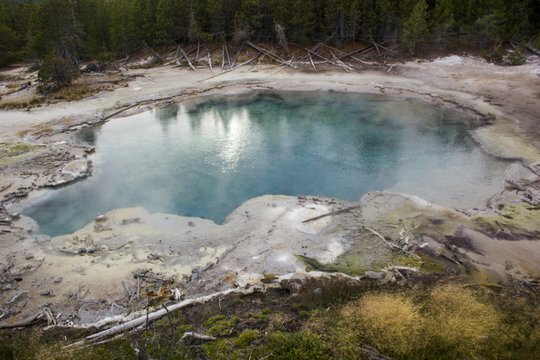 While well intentioned, the Yellowstone National Park fisheries department is following shaky science at best with their efforts on the Gibbon River. 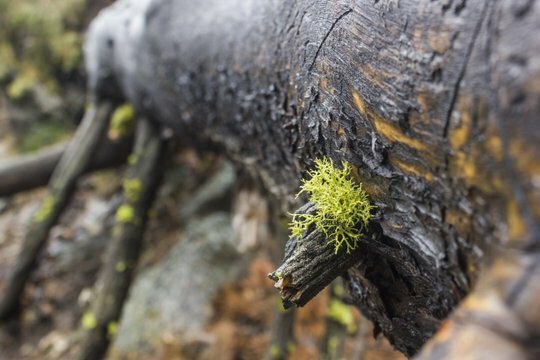 Restoring native species is an admirable endeavor under most scenarios. Unfortunately, the National Park Service is following a rather broad definition of "restoration" for restoring the upper Gibbon River. 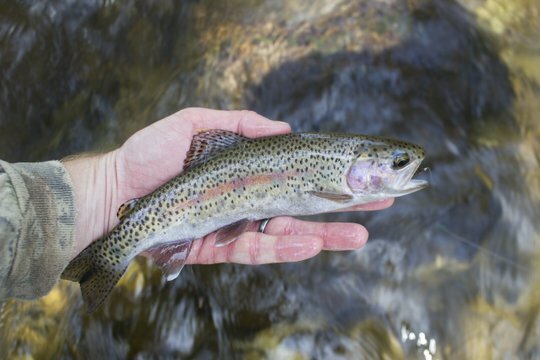 According to their own environmental assessment in the planning stages, the upper Gibbon River never contained west slope cutthroat trout nor did it contain grayling. Unfortunately, the National Park Service has decided to prioritize one invasive over another. Long term, the plan calls for the total elimination of "non-native" species all the way downstream to Gibbon Falls. That means that my favorite stream will no longer be worthy of a visit. Why? 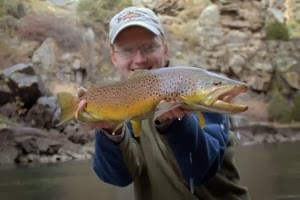 I travel to Yellowstone to fish for the wild brown trout of the Gibbon upstream of Gibbon Falls. In particular, the water around Norris Geyser Basin is specially suited to these beautiful fish. 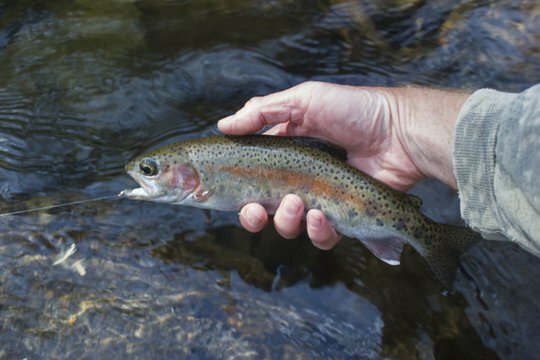 Once they are eliminated and replaced with cutthroat, this stream will be full of an inferior fish and one that is not even native. If it was a true native species restoration, I would have nothing to say even if I did not like losing the wild browns. Since it is not a true restoration, I have no problem saying that I think this is a worthless project that will ruin an amazing fishery. 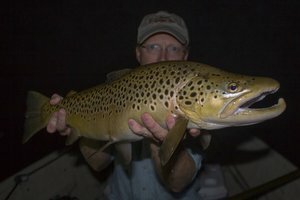 While everyone else is thinking about fishing the lower Gibbon River for lake run fish, I like hunting the giant brown trout that inhabit the upper watershed from Gibbon Falls upstream to Virginia Cascades. These fish are finicky, spooky, and everything else that you would want from large challenging trout. On my most recent trip to Yellowstone, I was able to spend a bit of time on this, my favorite river in Yellowstone. Nasty weather always seems to bring out the aggression in brown trout. This is often the case on the Gibbon River. Under normal sunny weather, fish will tuck up under overhanging undercut banks and in any other piece of shade they can find. These brown trout did not get large by being stupid. However, under cloudy skies and rain or snow, these fish come out to hunt. Truth be told, my favorite time for fly fishing the Gibbon River is mid summer on a bright sunny day. Knowing that the fish are tucked up under those undercuts helps immensely in locating them. However, you just cannot beat a good stormy day to get the fish on the feed. 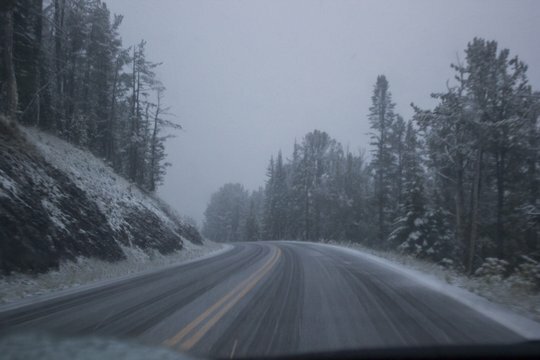 On our trip to Yellowstone National Park, the weather took a turn for the worse within our first couple of days. 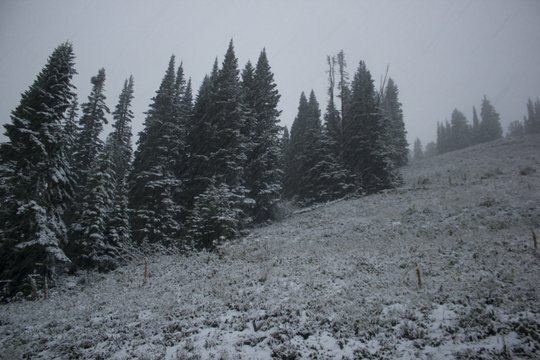 Unseasonably cool weather prevailed, eventually producing the first good snowfall of the season at higher elevations. More on that in a future blog post. Somehow, my wife kindly agreed to let me fly fish the Gibbon River in this nasty weather. The rain wasn't falling when we started, but soon a cold fine rain began to soak our rain jackets. I knew I was on borrowed time since I did not want to make my wife miserable. Thus, I focused on some of the best and also most accessible water near Norris. Fishing through this section, things started out rather slow. In time I found out why. The National Park Service restoration efforts had been ongoing and many of the stream's trout appeared to be missing. In their place were pasty pellet head west-slope cutthroat straight from a hatchery somewhere. The brook trout were lacking compared with other visits to this stream. I'm still unclear on whether fish are being mechanically removed (via electroshocking) or what is going on through this section. Eventually, the YNP fisheries hopes to completely remove non-natives from this section according to my last information. I'm seriously hoping that they instead allow the brown, rainbow, and brook trout to coexist with the cutthroat. 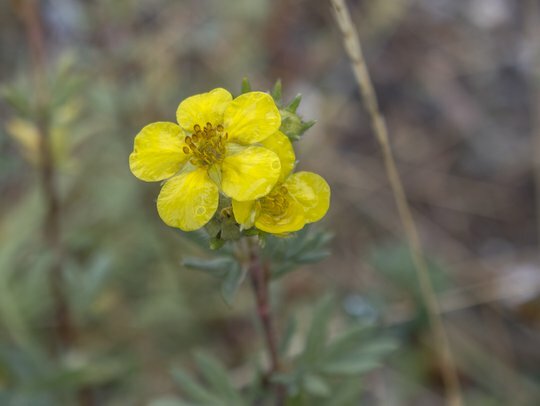 This is a contrived fishery after all and the Park Service should not be favoring one invasive over another. With the slow start, I knew I had two choices: either move faster to cover more water in my search for brown trout or slow down and really pick apart the water. When fishing this type of water, the worst thing you can typically do is to move too fast. Thus, I found myself slowing down. Often, this is a part of the process for me. As a Great Smoky Mountains angler and fly fishing guide, I'm accustomed to moving fast. Therefore, I always need to change my mindset and approach when fishing other water. This normally takes me an hour or so. Fly Fishing the Gibbon River: Success!!! Finally, as I was working into some of the best water I would fish on this trip, it happened. I had cast up above a deep bend pool and allowed my fly to nearly dead drift deep into the slot at the head of the undercut. A couple of twitches kept it from snagging the bottom. Suddenly, my line simply stopped. When I set the hook, I fully expected to be stuck to a large pile of weeds on the bottom of the stream. That first head shake told me otherwise. My amazing wife grabbed the net and went for the fish. Because of the heavy tippets I use for this fishing, it didn't take long before I maneuvered the fish to the bank and she slipped the net under my largest brown trout of the trip. While not as large as some I have caught on this stream, it was still an amazing fish. I fished a bit longer, catching a few more solid brown trout. However, it was getting colder and the rain heavier. My lovely wife was no longer having fun and that meant it was time to stop. As I mentioned above, the Gibbon River was simply not the same stream as before. Fish numbers and size were down significantly. I do not know if the National Park Service has modified their approach on this stream. Perhaps they are attempting to mechanically remove the majority of fish in an effort to avoid using poison on such a large stream. Perhaps the change in regulations is hurting this stream. Unfortunately, in conjunction with their new management strategy, the National Park Service removed all limits on "non-native" fish in this section. 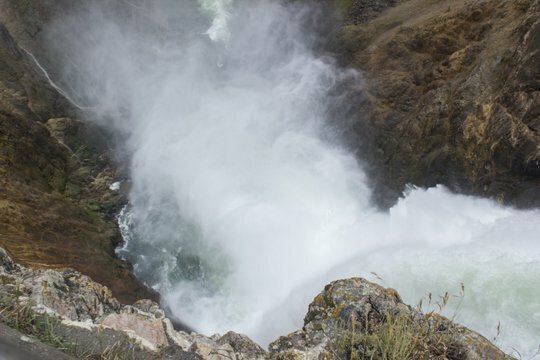 That does not extend to the non-native cutthroat, clearly demonstrating the hypocrisy of the Yellowstone National Park administration in managing this formerly incredible trout stream. If this bothers you as well, I encourage you to contact both the Yellowstone National Park fisheries department as well as the overall Park administration. 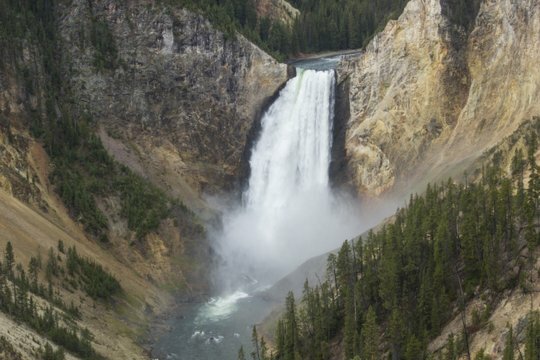 The Gibbon River will probably not be a good reason to visit Yellowstone National Park in the future unless things change. Before the removal efforts, myself and many others would travel there just to fish this stream. Now, I'm planning vacations to other destinations. There are still amazing places in Yellowstone, and I will be highlighting some of these from my trip this summer in future blog posts. Please sign up for the Trout Zone Anglers newsletter. You will receive approximately one email per month highlighting fishing opportunities in middle and east Tennessee and offering trip reports from my adventures both guiding and beyond. How things have changed since the last fishing report. First of all, Happy Thanksgiving and thank you for stopping by! Today I am thankful for another great year of guiding and feel tremendously blessed to be able to get paid to be out on the water every day. Thank you for helping to make that possible. Since the last report, the Smokies have seen unusually high water for this time of year. In fact, the water got high enough that it messed up this year's brown and brook trout spawn. Hopefully we don't get any more big rain events for the next two to three months as at least a few fish still have to spawn. The water was high enough to potentially destroy nests that were made prior to the high water event. 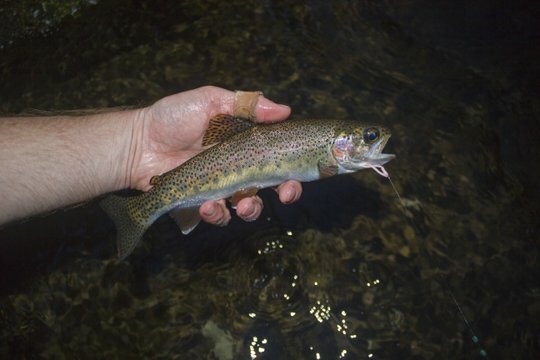 Overall fishing in the Smokies is okay but not great. This time of year is always tough with fish moving into winter mode. The fall blue-winged olives hatched well earlier this month and while a few of them are still trickling off, the best of this hatch seems to be over. A few caddis are also still around, but in general food will be sparse for the trout in the mountains for the next few months. That means its time to start thinking about the early spring hatches. Late February usually kicks things off with blue quills. 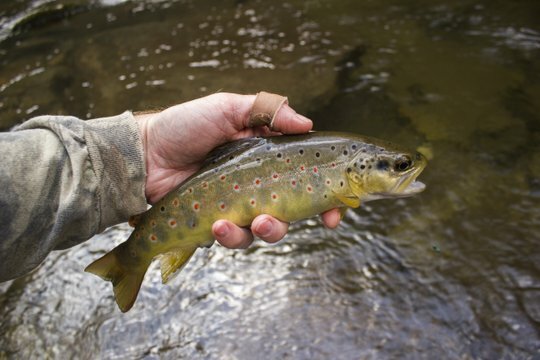 These are followed quickly by quill gordons and little black caddis in early March. From there, things build towards the annual crescendo which can be anywhere from late April to mid May in most years. 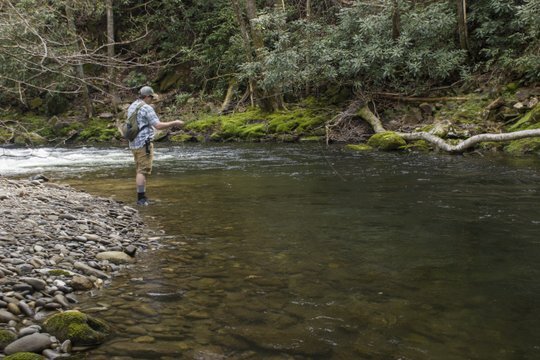 This is the time when the most variety and quantity of bugs overlaps for fantastic fishing throughout the Great Smoky Mountains. As an aside, guided trip dates book early for this time of year so make sure and get on the guide calendar early if you want to do a trip during the hatches. The next few months will be a much need break from constantly running for me. I love my job but a breather is always good. I'll even be squeezing in a few extra fishing trips for me during the next few months as I love winter fishing in the mountains and on our tailwaters and musky streams. Stay tuned for more here on the blog as I have a lot of Yellowstone adventures to still get caught up on posting as well. Thanks again for reading! While fishing was certainly an important part of my Yellowstone trip, it was not the main purpose of the trip. My lovely wife Leah had never been to Yellowstone so a thorough tour of the Park was in order. 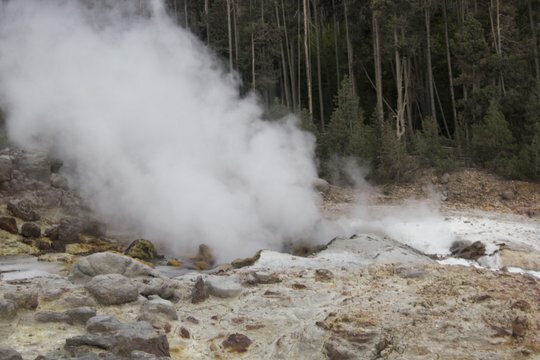 After getting camp set up and catching a few cutthroat trout, we decided to check out some of the geothermal scenery that Yellowstone is famous for. Our chosen campground for the duration of our stay in Yellowstone was at Norris. 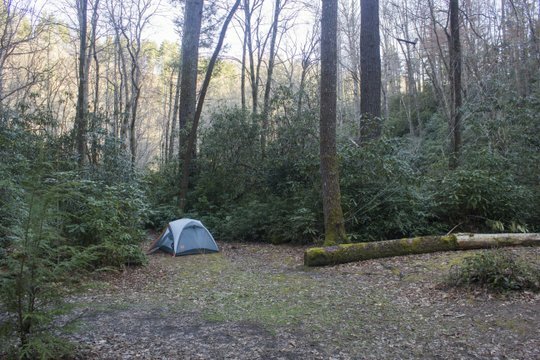 This campground is located in a good place to fish in several directions while not spending as much as some of the large campgrounds that offer reservations. These larger campgrounds are now charging $35 a night or more which is ridiculous for a tent pad and picnic table. Norris Campground offers camping for $20 a night and still also features nice bathrooms with running water, dishwashing stations and other basic amenities. 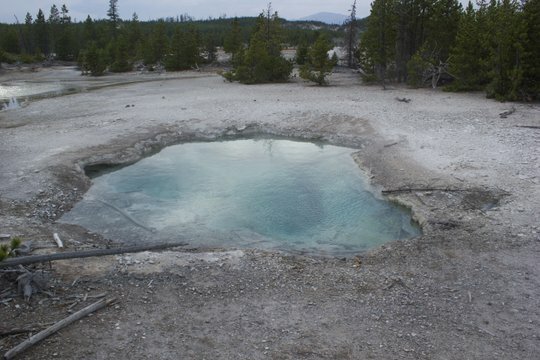 Not far from the campground is Norris Geyser Basin. With plenty of daylight left after catching some trout, we decided to check out the hot springs, geysers, and other geothermal features of Norris. The following are a few pictures from our boardwalk tour. As you may have noticed, our Yellowstone trip was a bit slow developing on the fly fishing front. While I had stared wistfully at trout streams in the Black Hills of South Dakota and through the Big Horns and beyond in Wyoming, the fishing was on hold until we arrived in Yellowstone. The first day in the Park was busy and so I did not get a fishing license until our second day there. The second day was busy as well. Our first night had been spent at the campground at Canyon for which I had obtained reservations (a must if you want a guaranteed site!). The plan was to wake up early on Sunday morning, take down our tent, and drive the short distance west to Norris. 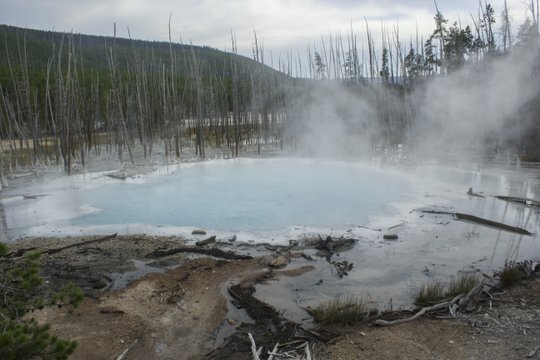 Here I hoped to snag a site at my favorite campground in Yellowstone. 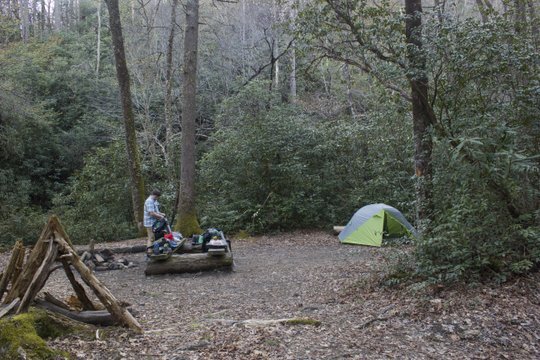 It just so happens that this campground is one of only two in the Park that are first come first served and have running water and flush toilets. We were trying to avoid pit toilets for the next two weeks as much as possible. Upon arriving at Norris around 8:00 am, we already had to wait in line while others signed up for their campsite first. When it was my turn, I was informed that the section I had hoped to get into did not have anything available...yet. If we wanted, we could hang around and see if someone would leave. There was one other party waiting ahead of us. When I asked what was available for tent camping, the ranger said she really only had one site available at the moment. When she said it was a large site and had a tent pad, I accepted without really thinking twice. She assured me that if we didn't like it, we could come back the next day and change sites. That seemed more than reasonable so we registered, paid for 10 nights, and were soon driving through the campground to find out if we liked our campsite. Turns out, we liked the campsite even better than expected. We were up against the woods at the back of the campground with neighbors on only one side and not too close at that. This gave the possibility of wildlife viewing right from our site! More on that to come a few posts down the road. We quickly pitched our tent, added our sleeping pad and bags, and headed back out for the day's adventure. That adventure needed fuel so we headed back to Canyon for breakfast. In much too great a hurry to pause for food, we had got the campsite we needed and could now focus on things like sustenance. The grill at Canyon in the gift shop and general store is a favorite of mine for breakfast. Nothing here is fancy, but they do the basics like pancakes, eggs, and hash browns well. We loaded up on fuel for the day and purchased fishing licenses. Then we pointed our car towards the Lamar Valley. On the drive over, I was already dreaming of Yellowstonecutthroat trout rising to dry flies. However, if there is one thing I should know about fishing out west, it is that nature will probably have the last laugh. When we arrived in the Lamar Valley, the wind was howling. Now, I know what you are thinking: it always blows hard out west. That is true, but the wind was unusually strong on this day. I asked Leah what she thought about fishing and while she didn't feel like casting in the wind, she said it would be just fine if I wanted to fish. "Just for a little while," I promised. I put together my 9' 6 weight Orvis Recon. With the wind blowing hard, I needed a little more rod than I would normally fish. While most people default to a 6 weight out west, I normally still fish my favorite 5 weight or even lighter. On this day, the extra backbone of my 6 weight seemed necessary. With the wind blowing so hard, I figured that surely some hoppers must be ending up in the water. I remembered some of the great hopper fishing I had enjoyed on my last visit here. Amazingly, only a couple of half-hearted glances resulted from fishing that hopper and none were hookups. I needed to change strategies quickly or my fast fishing expedition would result in a skunk. I moved up to the head of the pool where some faster water was coming in. Maybe they need a faster presentation and less time to examine my imitations. As it turns out, those fish didn't want a hopper either. What was going on? Here and there, I was seeing fish rising. My observation skills needed to be a bit sharper so I paid better attention. Then I noticed some gray mayflies drifting lazily on the current. Not a lot of bugs, mind you, but the ones I saw were getting slurped greedily. The bugs were out in the middle, but looked like about a size #14. When I opened my box, I grabbed a size 14 Parachute Adams and knotted on some lighter tippet. Attaching the fly, I was ready to fish again! On just the third or fourth cast I finally hooked up. It was a feisty little fish. While beautiful and a native Yellowstone cutthroat trout, I was here for larger specimens. I started fishing again and soon saw a larger shadow ghost up from the depths to inhale my fly. This time I got excited. 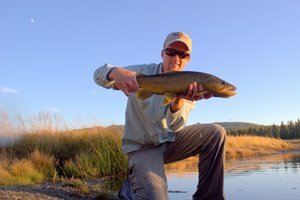 My Yellowstone fishing was underway! Leah was kind enough to not only help take pictures but also to net this fish. With the wind blowing hard, we were careful to keep the fish in the water until the last possible moment for a picture. Things dry out quickly in this environment and the fish definitely didn't need that kind of treatment. A few fish later, I was nearly satisfied. Just as I was about ready to leave, I noticed a rise on the far side of the current. Too far and windy to high stick, I was going to have to come up with an epic reach cast. With the wind blowing up the valley at 30-40 mph, I didn't think I would be able to pull it off. Then, just like that, everything fell into place, the fly landed and the line laid well upstream. I got just enough drift to see the fly sucked down greedily by another nice fat Yellowstone cutthroat trout. By this time, while I had only fished for 30 minutes or an hour, a shower was threatening, and Leah didn't want to stay out and get soaked. I suggested that we go looking for wildlife and we were soon back on the road towards the Northeast Entrance of Yellowstone. I always like stopping at a roadside pullout with a good view of Barronnette Peak to look for mountain goats. Wanting Leah to see some, this is where we headed. Sure enough, the goats were there. While looking at mountain goats through our binoculars, we kept noticing cars stopping back down the road towards the Lamar Valley. Wondering what they were seeing, I started scanning the meadow and trees in that direction. Suddenly I noticed something large moving...a moose and her calf!!! The moose magnet legend grows further still. This was the first time that I have seen moose in Yellowstone which made it particularly satisfying. By this time, the showers had seemingly passed and we headed back down the valley for one more quick stop along the Lamar. Stopping at a favorite roadside pool, I walked the high bank along the road and spotted several cutthroat. Next I scrambled down the bank to get into position to fish my way back up over each of those fish. A few fish later, I was satisfied. The wind was still gusting hard and I wanted to get back to camp before it was too late. We needed some down time after the long day of moving camp that we had.